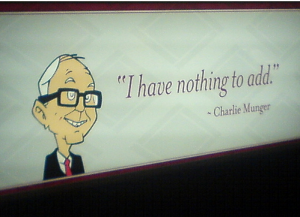 As Warren Buffett’s mentor, Charlie Munger needs no introduction. These 8 Charlie Munger quotes should help you recognize personal bias and help you get back into the right frame of mind. The following Charlie Munger quotes were taken from his 1995 speech, The psychology of human misjudgment. If you turn on the television you find the mothers of the most obvious criminals that man could ever diagnose and they all think their sons are innocent. The reality is too painful to bear so you just distort it until it’s bearable. We all do it to some extent. It’s a common psychological misjudgment that causes terrible problems. Interpretation: As the cliche goes, the worst lies are the lies we tell ourselves. Especially with losing stocks that you hold onto because you have to be right. The tendency to especially like oneself, one’s own kind and one’s own idea structures, and the tendency to be especially susceptible to being misled by someone liked. Interpretation: Warren Buffett said to hang out with people better than you. Find fellow investors capable of giving constructive criticism and take it. Don’t pout just because they have differing opinions. Your goal is to find good and profitable stocks. Not for somebody to make you feel good. They don’t do this in airplanes, but they’ve done it in simulators. They have the pilot do something where an idiot co-pilot would know the plane was going to crash, but the pilot’s doing it, and the co-pilot is sitting there, and the pilot is the authority figure. Twenty-five percent of the time, the plane crashes. I mean this is a very powerful psychological tendency. Interpretation: There are lots of investors with authority. Big hedge fund managers and even Warren Buffett. Do you believe everything they say? Even the gurus get it wrong. I’ve heard Warren say a half a dozen times, ‘It’s not greed that drives the world, but envy.’ And you go through the psychology survey courses, and you go to the index: envy, jealousy, in a 1,000-page book — it’s blank! There’s some blind spots in academia, but it’s an enormously powerful thing. Interpretation: Envy and jealousy have long been the downfall of humankind and it also applies to your portfolio. Who cares what the next guy is making or how well they are doing. It will just cause you to make bad decisions. Achieve your own success and let the others do what they do. We all know people who’ve flunked, and they try and memorize and they try and spout back. It just doesn’t work. The brain doesn’t work that way. You’ve got to array facts on the theory structures answering the question ‘Why?’ If you don’t do that, you just cannot handle the world. Interpretation: Thinking and having an opinion goes beyond regurgitating the facts. Going all the way back to schooling years, the facts are always provided. The most common method to pass was to just memorize and spit it out again, but the truly talented students always seemed to understand everything. Finally realized that these students constantly thought about the problem and asked questions. When it comes to analyzing and selecting stocks, do you just look at a few numbers and go through the motions? Or do you constantly seek answers and ask why? Then if you take the slot machines, you get bar, bar, walnut. And it happens again and again and again. You get all these near misses. Well that’s deprival super-reaction syndrome, and boy do the people who create the machines understand human psychology. And for the high IQ-crowd they’ve got poker machines where you make choices. So you can play blackjack, so to speak, with the machine. It’s wonderful what we’ve done with our computers to ruin the civilization. Interpretation: Near misses creates an addiction of trying again and again. How many stocks have you missed out on? Now think about your winners. You can remember vividly the stocks you missed out on, but don’t remember the details of your winners. By anchoring on your near misses, you enter dangerous territory of acting on bad behavior. Interpretation: When people are confronted with a negative fact about them, it immediately turns to defense. Rather than acknowledge, apologize, learn and become better, the immediate reaction is to blame, lie and make excuses. When you realize your investment thesis is incorrect, how do you respond? Look for facts to confirm your original views? Do you seek out analysis that goes against yours? Here, my favorite example is the great Pavlov. He had all these dogs in cages, which had all been conditioned into changed behaviors, and the great Leningrad flood came and it just went right up and the dog’s in a cage. And the dog had as much stress as you can imagine a dog ever having. And the water receded in time to save some of the dogs, and Pavlov noted that they’d had a total reversal of their conditioned personality. And being the great scientist he was, he spent the rest of his life giving nervous breakdowns to dogs, and he learned a helluva lot that I regard as very interesting. Interpretation: Simply put, when animals are put under severe amounts of stress, even the most conditioned personality will find that, just like Pavlov’s dog, they will have reversal of their conditioned personality. Warren Buffett lives in Omaha for a reason. He is distant from Wall Street and is in an environment where he can think calmly without external stress factors banging on his door. How often do you check your stock prices and worry when prices go down? And how have you made decisions under such conditions? Charlie Munger quotes are equally as timeless as Buffett. Difference is that Munger doesn’t talk about stocks that often. Instead, Munger likes to impart wisdom and lessons from other disciplines. Munger obviously gets far less attention than Buffett, but by reading his words, you can dig into the brains of one of the great thinkers. Not everything is going to be applicable to investing, but most of it is. Investing requires a multi-disciplinary approach and at first, the things you read may not make sense or you may not be able to understand how it is related, but take a step back and you’ll see that mostly everything can be applied to investing. Investing is more than just looking at numbers, buying and selling. Investing has a technical side to it, but more importantly, a huge part of it is behavioral. There are so many small investors with less experience and number crunching skills than you, but they have fantastic long term records. Simply because they keep their behaviors in check and are not swayed by what the market does.